American film director, screenwriter, producer, editor and composer, born 16 January 1948 in Carthage, New York. Director of such movies as "Assault On Precinct 13", "The Fog", "Escape From New York", "The Thing", or "Halloween", Carpenter himself composed most of the soundtracks for his films (sometimes with Alan Howarth). He was married to actress Adrienne Barbeau from 1979 to 1984. 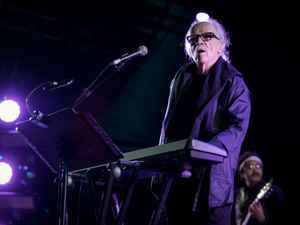 It's hard to talk about the musician John Carpenter without forgeting his films. He is a film maker who happens to make music for his own films, and that makes him a composer. It is important to stress that his music is never primarily thought as listening material on its own, isolated from the imagery of his films. This is specially true for his early works in pre-midi times, and those are probably Carpenter's best times as a musician. For the reissue of "Assault On Precinct 13" he states that "Assault On Precinct 13 is a truly minimalistic score. I never imagined that anyone anywhere at any time would listen to the music on its own away from the image and narrative". That is the quality we've came to appreciate in his music. Inconclusive soudscapes that repeat themselves with small variations once in a while that take you high and bring you back down again. Over and over again with no conclusion, track after track, soundtrack after soundtrack. "Assault On Precinct 13" quickly became a cult film, and the soundtrack a collector's item (until it got repressed last year). Thus, Carpenter became more and more aware of the potential of his soundtracks as musical pieces on their own and that has lead to the formation of the one off "pop" project The Coupe De Villes as well as several collaborations with rock and metal artists amongst others. Such are the cases of "Village Of The Damned" on which he collaborated with Dave Davis (of Kinks fame) or "Ghosts Of Mars" with guests stars such as Steve Vai and Elliot Easton. "Village Of The Damned" follows the tradition of Carpenters work as a composer and works wondefuly both on and out of the film. "Ghosts Of Mars" however, is a functional instrumental rock album (if you're into that sort of sound) but fails to work as a soundtrack. It only works to the extend that it is pure marketing and that has never been the case in Carpenter's work as a composer.